Canoeing at Cardigan Bay Active01239 612133work CanoeingThe gorge itself was hewn through a slate hill by a glacier retreating to the Irish Sea at the end of the last ice age. The Teifi gorge is one of the best examples of tidal gorge in the whole country and offers a safe and awe inspiring location for your whole family to try a fun new sport. The steep, densely wooded banks form an important habitat to species of otter, red deer. Peregrine falcon, kingfishers, dragonflies, salmon and sewin (sea trout. The gorge has been an important centre of coracle fishing and slate quarrying for hundreds of years but now the gorge forms part of the teifi marshes nature reserve. 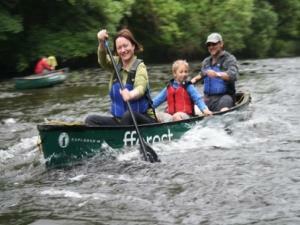 Our Open Canoe trips are fully guided journeys, using canoes which seat 2 or 3 people. Trips last around 2 1/2 hours and include all equipment and instruction. Canoeing in the gorge is a stunning adventure in the silent and untouched teifi gorge. The river is very slow, flat water for most of the journey and there are a set of gentle rapids which you can run at the end of the trip. Expect to see native wildlife including kingfishers, rare dragonflies and if you’re really lucky an otter! The gorge itself was hewn through a slate hill by a glacier retreating to the Irish Sea at the end of the last ice age. Minimum age 3 years, no experience is necessary and you can even bring a well behaved dog!